VALENTINE’S DAY can be a time of wonderful surprises, even for those who aren’t looking for love. Delight in these charming classic stories of unexpected romance, passion and desire. 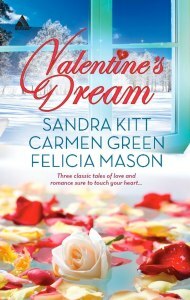 This anthology features three classic tales of love and romance sure to touch your hear from authors SANDRA KITT (Love Changes Everything), CARMEN GREEN (Sweet Sensation), and FELICIA MASON (Made in Heaven).